With the theme, “Teaching and Learning Experience in OBE-way”, Faculty Development Seminar-Workshop once again was made possible last November 8, 2012 at the Eliza Multimedia Center attended by the Teaching Staff of MPC Naga. Dr. Mariel R. Estrella, ORES Director opened the program by giving the message and an overview of a 1-day affair. The statement of purpose was delivered by Ms. Adelpha Phan, BSHRM Head. 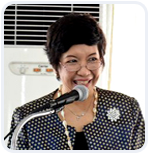 MPC President, Dr. Marilissa J. Ampuan conveyed her inspirational talk on OBE (Outcome-Based Education) while Dr. Melinda SB. Gimal, Dean of Academics enthusiastically talked on the “Taxonomy of Learning Domains”. Ms. Gloria B. Tapan, BSBA Head presented the Workshop Mechanics. Right after the clustering of faculties, the workshop started. All faculties participated on the activities given wherein enhancing of syllabus turning out into OBE was taught. Before the Seminar ended, faculties presented their outputs and critiqued by the concerned personnel. The overall synthesis was given by Ms. Christine Eusebio, BSHM/BST Head. Teamwork and great combinations brought University of North Eastern Philippines to beat the powerhouse MPC Blue Dolphins, 3-2, in PRISAA Elimination Games Volleyball men’s division held at University of Nueva Caceres Sports Palace last November 23, 2012. The Sports Palace was full of intensity coming from the fans and from the players of each team. The first and second set was in favour of the Blue Dolphins with the help of Gerson Soliman and Team Captain Justine Hernandez but in the last three sets, UNEP came from behind and grabbed the victory particularly in the 5th set, 15-12. “Practicing everyday from 3 to 6 pm was our preparation for this fight and also for this tournament“, words coming from UNEP Head Coach Manuel Cabrera. He also added, “Magaling ang MPC Naga pero ang naging advantage namin siguro is height, meron kaming 11 consecutive championships and last year lang naputol and this year we are hoping for the championship”.